Lock in a great price for Gerbrandy State – rated 8.9 by recent guests! Loved the family room with bunk beds. Spacious and comfortable. Game room was a bonus and big hit with the kids. Very nice owner, beautiful rural lanscape, clean and neat house, delicious breakfast with fresly baked bread. De mooie locatie en de geweldige ontvangst ! We hebben zeer leuke tips gekregen om te bezoeken . De ontvangst was zeer hartelijk met goede uitleg naar een heerlijke kamer. Ontzettend leuke locatie op geringe afstand van Sneek met alle faciliteiten en ontzettend enthousiaste professionele leuke gastheer en gastvrouw. Schone grote kamers en goede parkeergelegenheid en heerlijk ontbijt met alles er op en er aan. 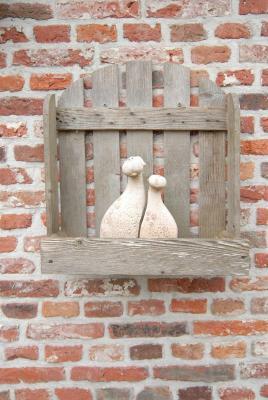 Het gewoon thuis voelen. Goed verzorgd ontbijt. Belangstelling van den gastheer Jan en de ongedwongen gesprek. heerlijk genoten van de gastvrijheid van zowel gastheer als gastvrouw ! heerlijk rustige locatie met alle voorzieningen die men wenst, en toch alles binnen redelijke afstand ! men ziet mij hier zeker terug !! Jan ist ein sehr sehr netter Gastgeber. Er hat trotz später Anreise persönlich auf der Straße auf uns gewartet und ein leckeres Bier haben wir auch noch bekommen. Schöne umgebaute Scheune von 1761, die renoviert wurde, ohne ihr den Charme der alten Zeit zu nehmen.Sehr persönliche, familiäre Atmosphäre. Selbstgebackenes Brot zum Frühstück und ansonsten alles, was man braucht. Sehr gutes Preis-/Leistungsverhältnis. W-LAN gratis. Wir würden jederzeit wieder dort übernachten. Wer die Standards großer Hotelketten mit Flatscreen, modernem Designerbad und riesiegem Frühstücksbüffet erwartet, ist hier falsch. 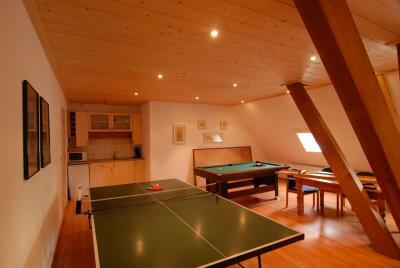 Located in a characteristic Old Frisian farmhouse in Boazum, Gerbrandy State offers rooms with free Wi-Fi and a seating area. 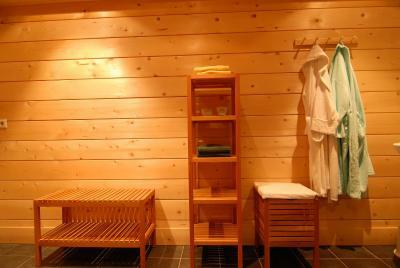 Facilities include a sauna and a spa bath. 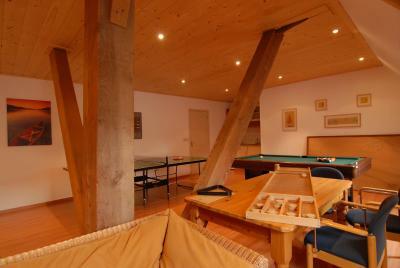 The rooms of Gerbrandy State are decorated in a rustic style with wooden furniture and wicker chairs. All rooms have extra long beds, an electric kettle, and a private bathroom. Some rooms have a kitchen. Every morning, Gerbrandy State offers a breakfast made with homemade bread and fresh, local products. Barbecue facilities are available as well. 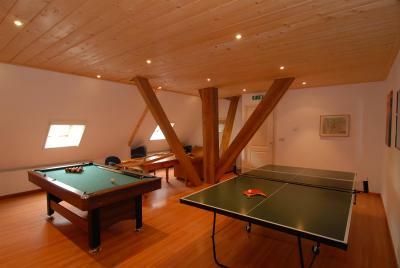 Guests can play a game of table tennis or billiards in the games room. Friesland’s countryside is perfect for hiking and bicycling. Bicycles rental is available at Gerbrandy State. 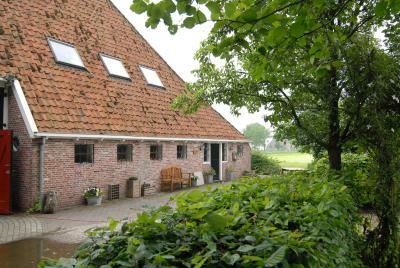 Gerbrandy State is located a 13-minute drive from Sneek, and a 20-minute drive from Leeuwarden. Free private parking is available on site. 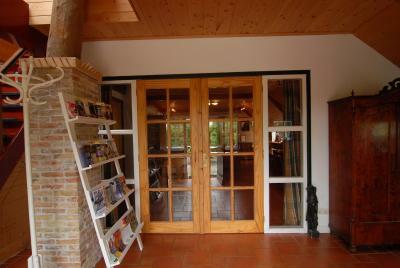 This property also has one of the top-rated locations in Boazum! Guests are happier about it compared to other properties in the area. This property is also rated for the best value in Boazum! Guests are getting more for their money when compared to other properties in this city. When would you like to stay at Gerbrandy State? This apartment is located on the ground floor and features a kitchenette, a dining area and a seating area. The bathroom has a shower and toilet. This suite has an extra separate bedroom with a long bunk bed. 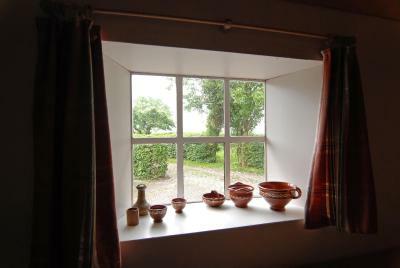 This twin room offers views of the countryside. The bathroom has a shower and a toilet. Includes a large bedroom and a smaller sized bedroom with a cupboard bed. There is a seating corner and a dining area. This apartment includes bed linen and towels. A service fee and cleaning fee of in total EUR 80 is required. House Rules Gerbrandy State takes special requests – add in the next step! Gerbrandy State accepts these cards and reserves the right to temporarily hold an amount prior to arrival.